An article published this year on Cell revealed Asprosin's discovery journey. Interestingly, this article's intention was to study neonatal progeriasis (NPS). Unexpectedly,it found a type 2 diabetes related hormone - Asprosin during this process. We will briefly introduce this strange trip as below. NPS is a genetic disorder in which patients continue to accumulate fat. In the process of research, researchers discovered that NPS suffers’ pFBN1 (profibrillin) is truncated in the coding, resulting in the deletion of the C-terminus of pFBN1, andthe deletionsection was named Asprosin. The process that theglucosereleased from the NPS suffers’liver moving into the blood can not be completeddue to the lack of Asprosin hormone in patients with NPS, so the body will usually show lower levels of blood sugar and insulin. Asprosin hormone levels tend to be high in obese/diabetic individuals with high blood sugar and high insulin levels. Chopra’s team found that the content of Asprosin in the blood of obese individuals was approximately twice that of non-obese individuals, and they also proposed the concept that obesity degree is positively correlated with the content of Asprosinin the body. 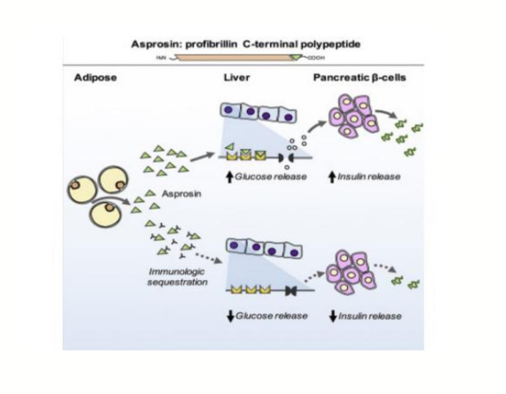 Researchers thought that special antibodies could be used to neutralize Asprosin to help reduce the level of glucose released in the patient's liver, thereby facilitating the release of smaller amounts of insulin by the pancreas cells. It is worth mentioning that the FBN1 gene not only encodes Asprosin (amino acid residue 2732–2871), but also encodes fibrillin 1 at the same time. In 1986, Engvall first isolated the fibrillin 1 protein. Cloud clone company has developed relatedprotein products, such as RPA593Hu01, PAA593Hu01, SEA593Hu, SCA593Hu and so on. It is a giant glycoprotein, a calcium-binding protein of microfibrils in connective tissue, whose defect is associated with autosomal dominant inheritance marfan syndrome. Ma Fang syndrome is a hereditaryhereditary connective tissue disease, which is characterized by slender and unsymmetrical limbs, fingers and toes. Biobool is currently working on the development of Asprosin related products. Welcome to consult.